Red, white and pool! Chrissy Teigen celebrated July 4th in the Hamptons on Long Island, New York, and worked her postbaby curves in a plunging one-piece swimsuit nearly the entire day. 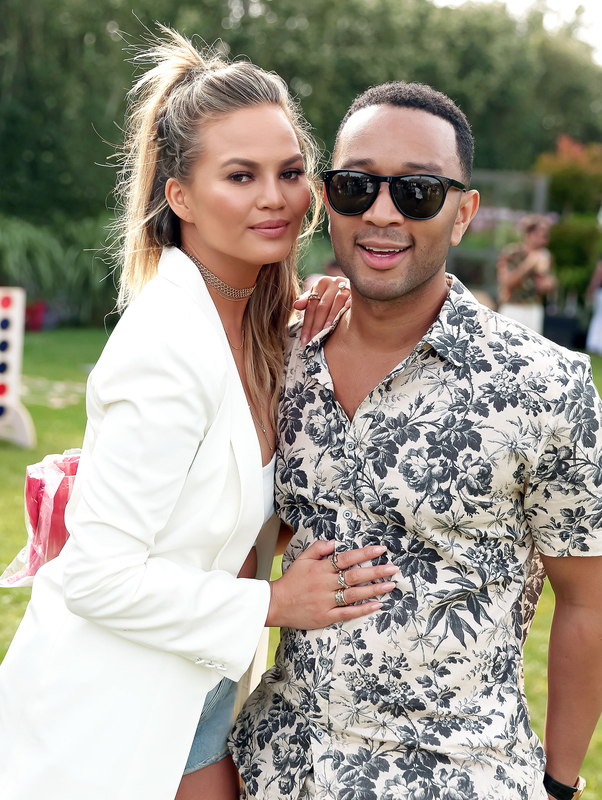 The Cravings cookbook author, 30, who gave birth to her first baby, Luna, in April, flaunted her tiny waist and décolletage in a rust-colored halter-neck bathing suit while lounging poolside with husband John Legend. She accessorized her swim style with a pair of mirrored aviators and fun floaties, including a cheerful cherry and a silver hashtag, both by the luxe inflatable brand Funboy. So excited to host #REVOLVEinthehamptons tonight!! @revolve #cravingsBBQ ??? While floating atop the hashtag sign that same day, Teigen took a tumble into the water and posted a photo of the fall via Instagram. "Hashtag cant swim #cantswim #REVOLVEinthehamptons #cravingsBBQ @revolve," she joked. Follow my snapchat, chrissyteigen, for all pre-bbq and bbq shenanigans with #REVOLVEinthehamptons! But she seemed to get a hang of the pool toys later on, sharing another image in which she and the “All of Me” singer sunbathed on top of the cherry double seater. “☀️☀️☀️ #REVOLVEinthehamptons,” she captioned the relaxing shot. Since she was making a splash in the water, Teigen went without makeup and even got her hair soaked while enjoying the hot weather. Later that night, the Sports Illustrated swimsuit model hosted a barbecue pool party for Revolve Clothing, which included Legend and fellow model Emily Ratajkowski. While cooking out, Teigen chose an off-the-shoulder crop top with crochet details, which she paired with light-washed, high-waisted cutoffs. She added a little sparkle to the look with a layered choker necklace and rings. Legend posed with his wife in a floral button-up shirt with matching shorts. And Ratajkowski, 25, coordinated with Teigen in a white crop and jeans. What do you think of Chrissy’s 4th of July swim style?